Even a simple lunch can be a feast for the senses in France. Here at Le César Café near Antibes’s Marché Provençal (the old farmer’s market), Matthew’s having a traditional Breton galette and I’m having a Salade Niçoise, which is typical fare for a hot, sunny day in the south of France. So why are Matthew and I so crazy about France? Well for one thing, it’s a foodie’s paradise and a Mecca for architecture, archeology, and art buffs like us. And for another, even though we truly enjoy winter in Norway, enduring the long months of cold and darkness means we need to address our Vitamin D deficit come summer. I think you’d find most Norwegians would agree — it seems like each and every one of them has a second home or regular vacation rental in southern France, Italy, Spain, or the Canary Islands. Matthew and I usually get our warm-weather fix in Provence, but we’ve never spent more than a couple of days along the coastline — until last year. A tremendous workload had worn us thin to the point of breaking. Rather than creating our typical complex itinerary, which usually results in us hopscotching between different cities every other day, we decided to stay put for a change. And although we’re not really beachgoers, we determined that parking our exhausted butts on the hot sand for a week was just what we needed. Consulting our beloved Rick Steves’ travel guide for a cheap way to do the French Riviera, we settled upon Antibes. The town keeps a fairly low profile, which is surprising considering it’s tucked in between two huge tourist destinations: Nice on one side and Cannes on the other. Unlike its glitzy, glamorous sister cities, Antibes is mellow, less expensive, and low on the celebrity quotient. Intense crowds are pretty much non-existent, even on holidays in high summer, except along the public beaches and in the weekend markets. 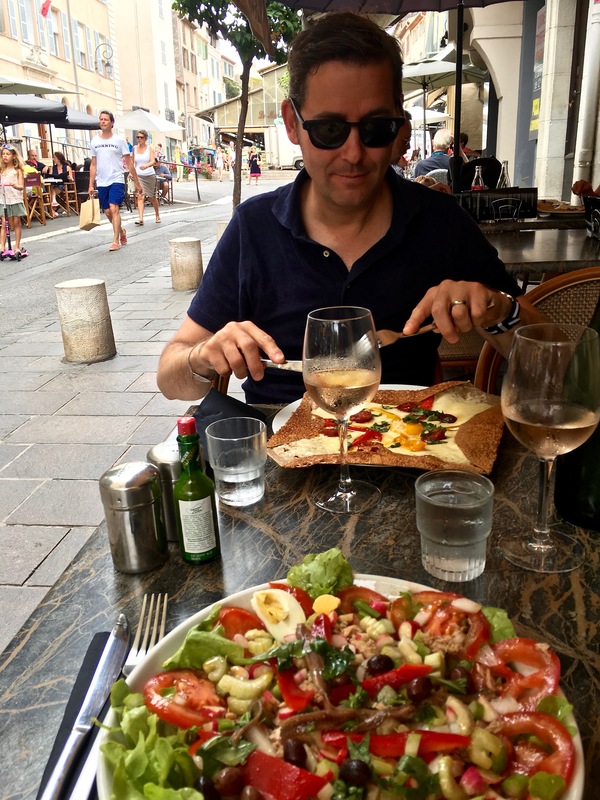 So, at the risk of telling you how great the place is and thereby increasing its tourist traffic, I’ll describe our adventures in Antibes last year … which led to it being our 25th anniversary destination this year. Lemme just start my series of stories by helping the Francophobes in the group get past their fears. “The French are rude, humorless, inhospitable, plus they smell bad, don’t speak English, and hate Americans” claimed one of our acquaintances when he heard of our travel plans. Since the guy has never been to France, his declaration lets you know the anti-Gallic sentiments circulating around the U.S. right now (despite Trump’s fixation with copying Paris’s Bastille Day parade). So let’s tackle the first frustration. Realistically, yes, if you visit only Paris in the height of tourist season, you may indeed find that waiters and shop clerks are hurried and brusque — just as they are in any American tourist destination besieged by hordes of sweaty, demanding travelers. Try visiting Michigan Avenue during a sweltering Chicago summer and see how pleasant store staff and tour guides are. Spoiler alert. They’re not. Even when you’re a native English speaker. 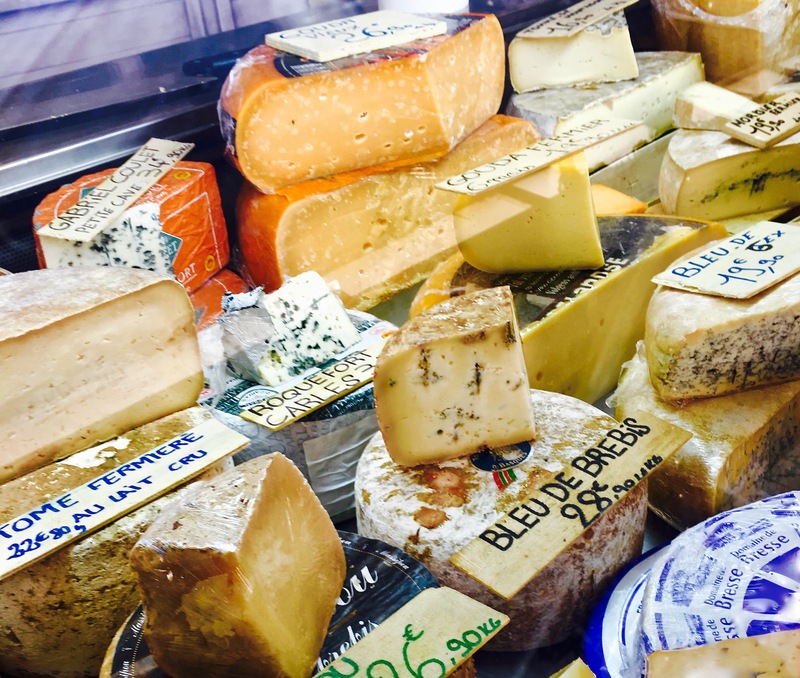 A fromagerie we visited doled out a warm welcome as well as incredible cheeses. Upon learning that we were Americans originally from Chicago, the French proprietress explained that her son was currently attending college there and loved it. She followed up with, “I wish you both much happiness, and please know that you are always welcome here in Antibes.” Could you ask for a friendlier reception? That’s why it pays to travel outside the typical tourist zones and hang out where the French vacation. Antibes is just such a place. The pace of life is leisurely, no one’s in a rush to process the next tourist, and people pride themselves on their warm hospitality, which reflects a mixture of French and Italian traditions. The local dialect is a blend of the two languages, so don’t worry about not being a native speaker. Most everyone speaks English quite fluently, although you’ll find that at least attempting a Bonjour or Merci will be appreciated. 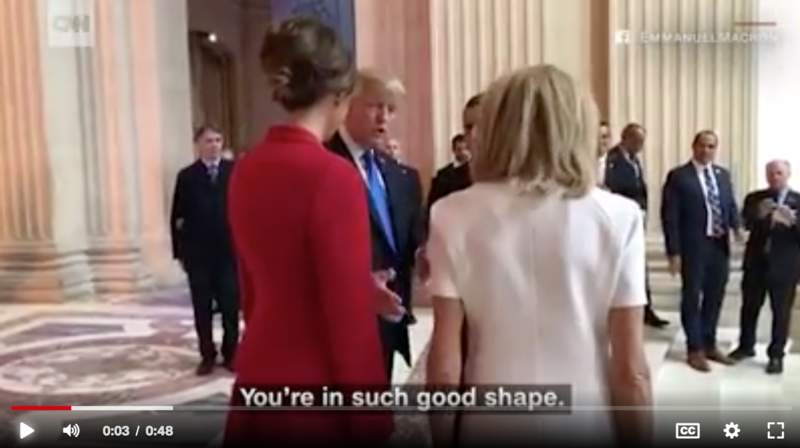 Pictured is a CNN clip from the morning that Trump met Brigitte Macron, wife of French President Emmanuel Macron. Everyone was astounded to see him reach for her hand and say, “You’re in such good shape,” then turning to her husband he noted, “She’s in such good physical shape. Beautiful.” Some within earshot say he clearly implied, “for a woman her age.” (Backstory: Macron’s wife was his high-school literature teacher and is 24 years older than he is.) Um, awkward. How do you recover from that faux pas? About that “hating Americans” thing. 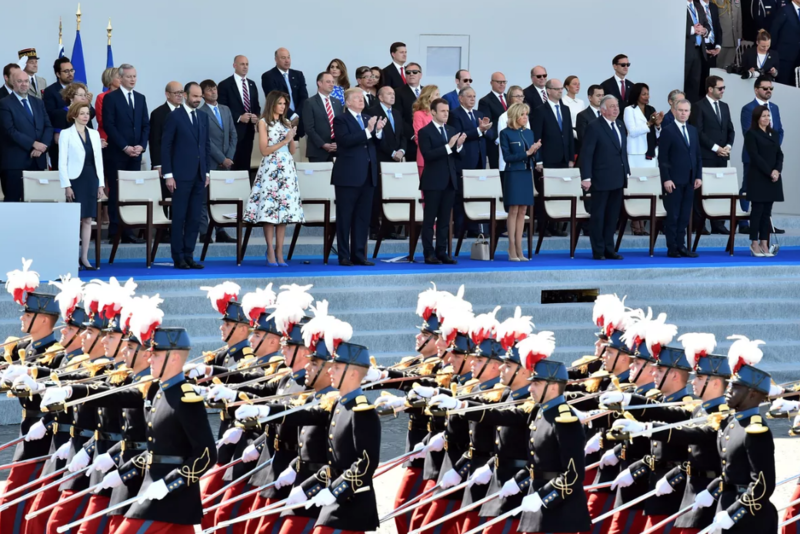 Well, unfortunately our president didn’t make himself too popular last year when he visited France during our trip. But we found that his boorishness didn’t result in our being treated badly. We stayed at an incredible B&B called Mas Djoliba, where breakfast each morning frequently included long chats with fellow guests and our hosts, Englishman Mike and his French wife Delphine. Every day brought a new headline highlighting some fresh Trump embarrassment, but we all commiserated together and laughed it off. Gotta keep a sense of humor when you have a president who’s intent on cutting a swath of diplomatic self-destruction worldwide. Mas Djoliba has an amazing pool just perfect for when the afternoon sun makes swimming in the sea a sticky experience. A poolside pastis and rosé completes the picture. In the background, you can see the terrace where breakfast was served. Mike and Delphine are the perfect hosts, friendly, attentive, and super helpful at planning day trips and securing car and boat reservations for you. Mas Djoliba books up quick, so reserve early. We spent our first four nights in a room that was only $135 per night, with its private bath located just a few feet down the hall. Matthew stands at the entrance to our en-suite room with a patio, which was $185 per night. Both rates include breakfast and the use of the gorgeous gardens, pool, and boule court. Spending the evenings sitting on our little patio listening to the “cigales” (cicadas) was pure heaven and worth the extra money. 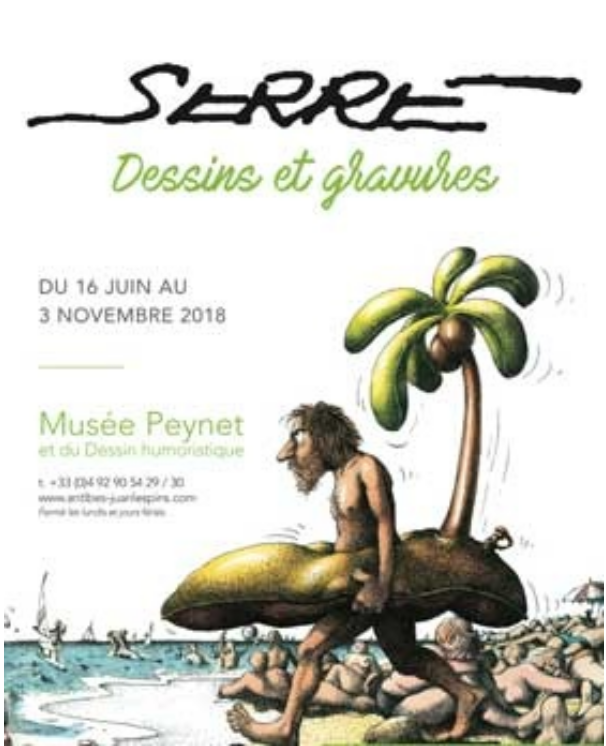 If you’re a fan of “bandes dessinées” — French comics and satirical illustrations — check out the Musée Peynet et du Dessin Humoristique in Antibes. It contains many of the works of Antibes-born Raymond Peynet and other famous cartoonists. Upon our arrival in Antibes, we hailed a cab to reach our hotel. When the taxi driver stopped to pick us up, the guy in the car behind him honked angrily, then pulled up alongside to treat us with the full pictorial dictionary of rude but vastly amusing Gallic hand gestures. Our driver’s response? He laughingly called out, “Kisses, kisses! I love you, too, my good friend!,” then followed up his love fest by repeatedly smooching his fingertips using the sign language we associate with “delicious.” Quality entertainment, and we hadn’t even reached our hotel yet. The comedy duo Ylvis (brothers Vegard and Bård Ylvisåker) not only has a late night variety show, but they also contributed to TVNorge’s program, “Stories from Norway.” Click here to watch their awesome music video commentary on Norway’s hysteria when Justin Bieber visited in 2017. Don’t get me wrong, Norwegians are funny, too, but it can take awhile for them to warm up and share their typically dry wit with you. Only recently have some of the really zany comedic Norwegians made American headlines, like Ylvis, whose video and song “What Does the Fox Say?” became a U.S. hit back in 2013. But while I’ve rarely seen any public displays of tongue-in-cheek humor on the streets of Oslo, the French flaunt their funniness fairly directly so that every passerby can share in the chuckle. Even cautionary street signs strive for a light note. Check out the gallery of curbside comedy below. How’s this for some double-entendre advertising? It’s a store in Cannes (where May-December romances abound) that features bling to pimp out your phone, as well as gaudy home decor. It clearly appeals to the young girls, who prowl the wares inside while their sugar daddies hang out under the appropriately labeled awnings. You can see Matthew’s thrilled I made him play the part. Let’s make a public toilet fun with a play on the word, “loo.” By the way, the English term “loo” comes from the old French warning “Gardez l’eau” (gar-day low), which means “watch out for the water” — that’s what people yelled right before they dumped their chamber pot out the window and on to the street below. Next to the public toilet is a store specializing in all kinds of toilet accoutrement, such as this toilet-brush-slash-microphone. Might as well entertain yourself while coppin’ a squat. And since I’ve already touched on toilet humor above, I’ll just finish off by combatting the rumor that the French smell bad. Perhaps French folks of yesteryear shied away from the shower, but today, most smell better than many Americans. After all, the French have perfected the art of perfume (more about that in an upcoming post). And if you haven’t tried the French deodorant Biotherm, it’s awesome! Super effective without the painful rash-inducing burn. Okay, my unpaid advertisement is over. Let’s move on. I’ll end by addressing the last little item on the laundry list, the bidet. Contrary to popular opinion, it’s not the French way of perpetually bypassing a full-body bath. 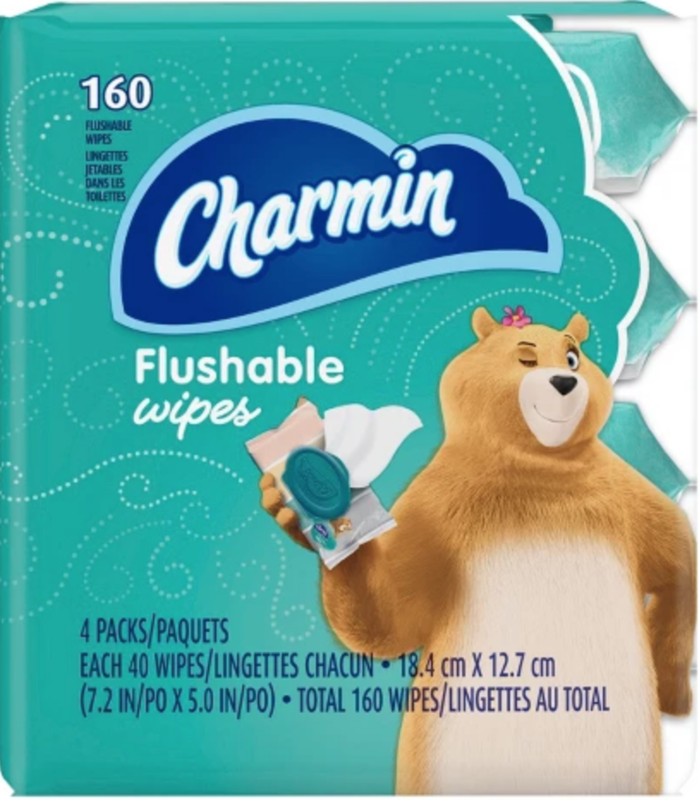 It’s a handy little appliance that takes the place of all those weird flushable wipes that are so prevalent in the U.S. now. Plus, it’s environmentally sensitive (in more ways than one, if you know what I mean, wink wink.) It’s quite refreshing to flush out the old bikini bottom after a long day spent on a sandy beach — those pesky granules work their way in absolutely everywhere. 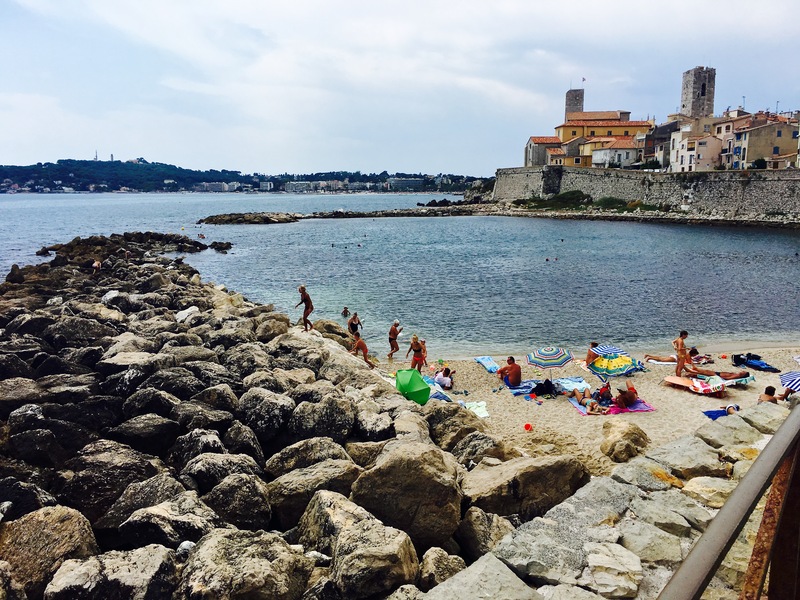 So now that we’ve got the messy stuff out of the way and assuaged the fears of the Francophobes in our group, let’s move on to the beauty and backstory of Antibes itself … in my next post, with big photo galleries comin’ right up.